POLL: Has your financial situation improved in the last year? The nation's poverty rate dropped last year for the first time since 2006, but the number of Tennesseans living below the poverty line increased in the most recent two-year period, the Census Bureau said Tuesday. Nationwide, the poverty rank fell to 14.5 percent from 15 percent in 2012, driven by an increase in people with full-time jobs last year. The number of people working full time rose last year by about 6.4 million to 105.8 million, including nearly 1 million households with children under 18 years old. Employment also improved across the mid-South. But poverty rates in Tennessee, Georgia and Alabama remained above the national average. In Tennessee and Georgia, one of every six residents was in poverty during the most recent 2012-2013 survey by the Census Bureau. The share of persons living in poverty rose to 18.4 percent in Tennessee, up 1.9 percent, and to 16.4 percent in Alabama, but it fell slightly in Georgia to 17.2 percent. 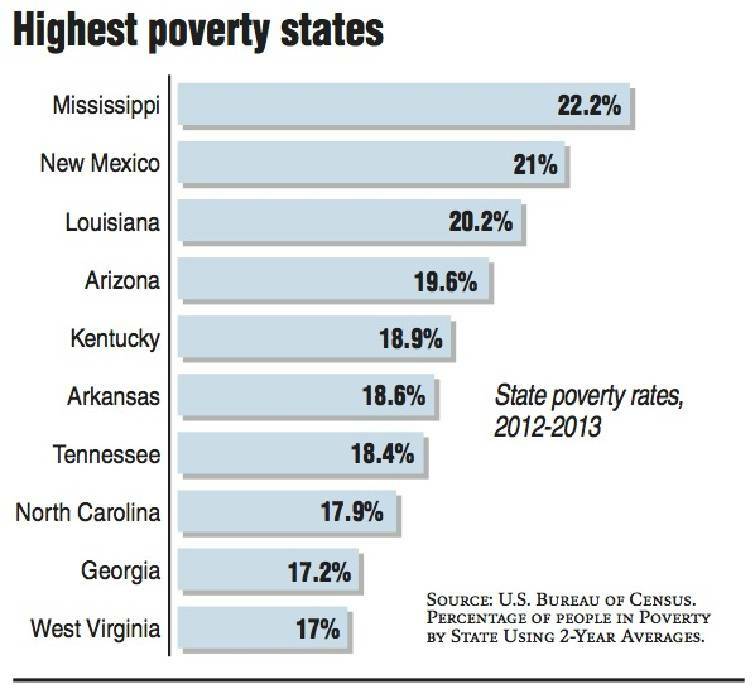 Poverty was highest in the nation in Mississippi, at 22.2 percent, and lowest in New Hampshire, at 8.6 percent. Nationwide, the child poverty rate dropped last year for the first time in a decade. In 2013, 19.9 percent of all children in the United States lived in poverty, down from 21.8 percent the previous year. "We are seeing that the economy is certainly having an impact on that group," said Chuck Nelson, a division chief at the Census Bureau. But the news was not all good. Despite the decrease, the poverty rate last year remained two percentage points higher than in 2007, before the Great Recession started. And because of population growth, for the third straight year the number of people living in poverty did not shrink significantly. There were 45.3 million people living below the poverty threshold, which last year was an annual income of less than $23,624 for a household with four people, including two related children. In 2012, about 46.5 million people were living below the poverty line. Median household income last year rose to $51,939, up only slightly from $51,759 the previous year. It was the second year median income was roughly flat after two straight declines, the Census Bureau said. Adjusted for inflation, median household income was 8 percent lower than it was in 2007. Latinos were the only ethnic group to experience a significant increase in median household income last year. Their median income rose 3.5 percent to $40,963, the Census Bureau said. With lower-earning families seeing significant gains, the disparity between the highest-income and lowest-income households showed no significant change from 2012 to 2013. But the gap, which has been widening in recent decades, remains substantial. The top 5 percent of households last year garnered more than 22 percent of all income in the country, and the top 20 percent accounted for more than half of all the money earned. The share of income that went to the bottom 60 percent of households was just 26 percent. By age group, the Census figures show there were significant income gains only for the youngest and oldest households. Income for households headed by 15-to-24-year-olds jumped 10.5 percent in 2013 from the prior year, reflecting the increase in young people getting full-time jobs. In homes of those 65 and older, income went up 3.7 percent, helped by inflation adjustments in Social Security payments. The wage gap between men and women showed no change. Women on average had an income of $39,200 last year compared with $50,000 for men -- meaning they earned 78 percent of what men earned. "That means that millions of women and their families continue to slide backwards year after year," said Fatima Goss Graves, vice president for education and employment at the National Women's Law Center. "We can and must do better than this. It's time to close the wage gap now." The annual report also included data on health insurance coverage. The Census Bureau found that 13.4 percent of Americans did not have coverage for the entire year. The Census Bureau said it made changes in the way it calculated that figure as it prepared to gauge the effect of coverage that began this year under the Affordable Care Act, also known as Obamacare. Under the previous methodology, the percentage of people without health insurance had dropped to 15.4 percent in 2012. But Census officials said the 2013 figure should not be compared to the 2012 one. The nation's high poverty rate has been a key argument for advocates of increasing the federal minimum wage from its current $7.25 an hour. About 17 percent of restaurant workers live below the poverty line, according to a report last month by the Economic Policy Institute. Fast-food workers have held protests in Los Angeles and other cities urging a higher minimum wage. The nonpartisan Congressional Budget Office has said increasing the federal minimum wage to $10.10 an hour would lift 900,000 people above the poverty line. Staff writer Dave Flessner and The Los Angeles Times contributed to this report.